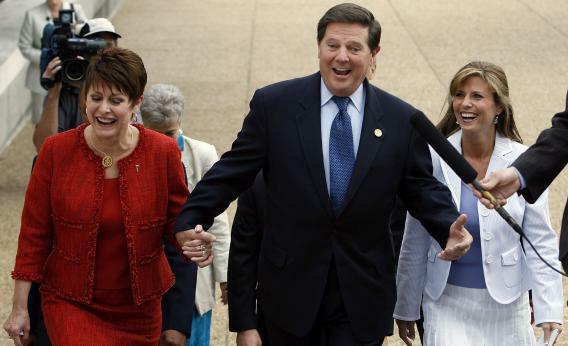 Former House Majority Leader Tom Delay celebrated budget cuts that weren’t. The Huffington Post has, admirably, been letting its reporters spend lots of time and energy reporting on the damage of sequestration. Now totally forgotten, covered mostly in trade publications, the mandatory spending cuts that went into place because Republicans couldn’t agree to higher taxes* are actually slicing into spending that people find useful. That was the point—cuts so dumb that Congress would want to avoid them. So this section of Sam Stein’s report stuck out for me. By 2007, NIH funding had jumped to $29.2 billion, a massive increase from its $20.4 billion level at the start of Bush’s presidency. By the time President Barack Obama took office, it had gone up to $30.8 billion. The 2009 stimulus package known as the American Recovery and Reinvestment Act put a significant amount of money behind scientific research as well. But under sequestration, many of those gains were lost. This year, the agency’s budget has gone back down to $29.1 billion. Here we have an example of the Republican Congress fulfilling its promise to undo the spending patterns of the old GOP. There was outrage on the right when Tom DeLay celebrated one of the final Hastert-era budgets by saying the party had “pared it down pretty good.” No—the budget couldn’t just inch up with smaller increases on the line items. It had to be cut. And now it has. *Yes, yes, Democrats were at fault too, but they’ve been more willing to propose small entitlement cuts than Republicans have to propose taxes.